Holy smokes! You don't know what a half-smoke is?! Do you know what a half-smoke is? One thing is certain, Washingtonians don't take their half-smokes lightly. WASHINGTON -- If you are from D.C. or live in the nation's capital, chances are you've heard of a half-smoke. But, if you happen to be among the few (including myself) who don't know what a half-smoke is, then this article is for you. Naturally, after having the discussion in the WUSA9 newsroom, we asked the question on Twitter. Do you know what a half-smoke is? One thing is certain, Washingtonians don't take their half-smokes lightly. So what is a half-smoke? A half-smoke can be defined as a local sausage delicacy found in the D.C. metro area. 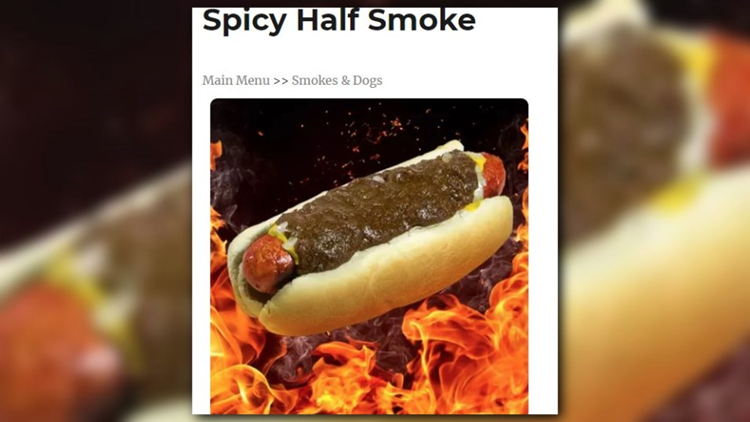 Now, not to be confused with a hot dog, a half-smoke is generally bigger, spicier, and made with more coarsely-ground meat. A half-smoke is usually made with half-pork and half-beef. It's smoked and then served with a variety of condiments, including chili sauce. Washingtonians can't seem to agree on who actually invented the local sausage. Another outstanding question is where does the half even come from? Some say it's because it's half beef, half pork, while others argue it's because the sausage is halved before being grilled. If you happen to be like me, a person who (up until today) hadn't had a half-smoke, then consider heading over to Ben's Chili Bowl for their 60-year celebration to try the local dish.